Is it possible to ruin your chances of getting hired before you even meet your interviewer? Yes it is. We frequently get questions from readers about the interview process. One of the most common is why they never make it past the first interview. Although we covered interview tips in a recent blog, here’s one more key fact—the formal interview process often starts before you even step foot in the building. We’re talking about the phone interview and any other interactions you have with your recruiter or HR professional leading up to the interview. Many times, this is when mistakes happen. Here at Movin’ On Up, we don’t fault jobseekers for tripping up. If you’ve never had a phone interview before, how are you supposed to know how that world works? Everyone has to start learning somewhere. To help prevent you from committing these pre-interview mistakes, we asked our recruiters for their thoughts. Here’s what they had to say. If you’re the best person for the job, recruiters and HR professionals want to see you succeed. After all, your success is their success! Although calling every once in a while is fine, this means that calling every day to check in is not only unrequired, but also rather bothersome. In extreme cases, applicants have even been known to treat their upcoming interview like a side dish to a main course. Literally. “I once had an applicant call to follow up on their application while going through the drive through. Then they put us on hold to order a number one with a soda.” — Tracy S., MI. But the real reason to stay away from overcalling your recruiter or HR contact? It makes it look like you’re unable to do work on your own, and need constant contact. Employers frequently look for applicants that are clearly able to handle deadlines and projects on their own. The job search is hard. Constant rejection can sting. However, you should never bring up these experiences in your interactions with recruiters or HR professionals. They want to see you at your best, not your worst. “I’ve had some applicants start our first phone call off by speaking poorly of their previous managers. While I understand bad managers exist, when an applicant starts off an interview that way it makes me think about how they’ll talk about their future manager if we hire them. I’ve also had applicants speak at length on businesses they have applied to and been rejected from. Basically, try to keep negativity out of any interaction with your recruiter or HR professional.”—Carlos D., OR. “It’s hard to make an offer to an applicant who reveals too many personal issues during a phone interview. Although I get that a bad divorce or single parent situation can be tough, I want to use the phone interview to see what you might look like as part of a business. Spending so much time on negative personal experiences takes away from that.”—Roxanne P., TX. Keep the conversation to your accomplishments and accolades. Although everyone has bad experiences, a phone interview is not a great place to share them. Regardless of how friendly your recruiter or HR contact is, you still need to remain professional. Whether they’re nervous or tired of the whole job search process, some applicants say or do things they shouldn’t. This can be over the phone during an initial interview, or by email. But what exactly does “professional” mean when it comes to the job search? Not doing these things. “Sometimes I’ll call an applicant and have a great phone interview, but then they disappear. I’ve had some cancel interviews multiple times with issues such as car trouble, personal problems, and last minute emergencies out of town. Once I received all three excuses from one person! Although I get that life happens, we can only reschedule so many times.” —Tracy S., MI. “What gets to me is when applicants don’t do their research. I’ve had people come in saying they think we’re just a temp service and don’t do anything else before I can even tell them about how I can help them with a temp-to-hire or other eventual fulltime position. They come in hurt and frustrated before I even say anything. Since we’re in a smaller market and have established clients, I might be the only one with access to that job posting. And they’re perfect for it!”—Shannon J., WA. The job search can be frustrating. However, put that frustration away when you’re having a phone interview or emailing your recruiter or HR professional. Be the best version of yourself, and always believe that this one could really be the one. If you don’t believe in yourself, they won’t either. Click here for more in our Ask a Recruiter series. 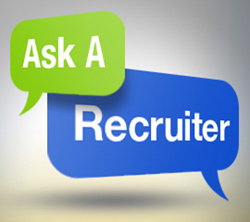 Have questions for our recruiters? Let us know in the comments below! Next Post Poll Results: Does Charitable Giving Matter? Now, I have found useful information in this article as I am guilty of sabotaging my chances while speaking on the phone with a recruiter. I believe it was my discouraging remarks about the current Job market at the time. Many recruiters had contacted me several times and some created a positive feeling about my future employment status. I fullfilled my part by editing & submitting my resume and then…nothing. I felt used only so they could add another candidate to the pile they would send to their client for review. Much of my time and sometimes even expense seemed a waste when my resume would only get placed at the bottom of the pile. How could I know when all communication just ended without an explanation?